FREE-SCORING Premier Division leaders, Park Bar have set the pace at the top of the table this season netting an average of almost five goals a game in all competitions and they will go all guns blazing against Oxford Stars on Sunday as they attempt to maintain their one points lead. 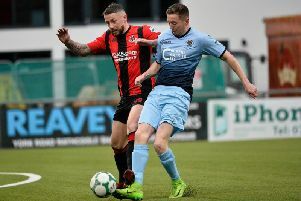 Meanwhile Trojans are hot on the heels of Park Bar and they will be hoping to keep the pressure on with victory over Campbell’s at Brandywell Showgrounds. The Creggan men secured a confidence-boosting win over Brandywell Harps on Sunday and will be keen to kick-on but they face an improving Campbell’s side. Top of the Hill Celtic are still in the race for the league title and they will fancy their chances of another victory when they meet a young Tristar team at Lisnagelvin. Elsewhere, Brandywell Harps meet Culmore at Prehen while Don Bosco’s meet bottom of the table side, Prehen. Premier Division - Prehen v Don Bosco’s (Prehen 3); Trojans v Cammpbell’s (Showgrounds); Top of the Hill Celtic v Tristar (Lisnagelvin 2); Brandywell Harps v Culmore (Prehen 1); Park Bar v Oxford Stars (Brandywell). All games kick-off at 11.30 a.m.